Canadians often describe their country as a “mosaic.” This idea is present on government websites and in many contemporary articles in the media (on outlets such as The Globe and Mail, Maclean’s, and the Huffington Post) and most importantly in the minds of people across the country. Though used in different contexts and with different goals, the mosaic almost always describes Canada as a multicultural landscape and symbolizes a national ideology of inclusion and diversity. Canadians hold great pride in this idea, placing it on the progressive end of a spectrum opposite to the American melting pot. Yet we rarely question where the term comes from. Many Canadians would likely be astonished to find that the first person to use the term “mosaic” to discuss the national character of Canada was in fact an American. In 1922 the travel writer Victoria Hayward published Romantic Canada, a piece of travel literature detailing her journey from the Maritimes to British Columbia. She uses the term mosaic to refer to both the variance in European church architecture found in the Prairie provinces and to the Japanese fishermen of the Fraser River in British Columbia who had “stepped out of the Far East to serve this river of the Far West.” She painted a rather patronizing portrait of Canada, focusing on the welcoming Gaelic housewives of the Maritimes, the fusion of French and Indigenous culture found in Huron villages, and the Swedish music carried on the winds of the Prairies. From Hayward’s American point of view, Canada’s population had distinctively “old world” characteristics, but incorporated smaller groups of Asians and Indigenous peoples to create an exotic landscape, which she referred to as a mosaic. Hayward’s concept was then adopted by the Canadian Kate Foster in her 1926 publication, Our Canadian Mosaic. She describes seventeen groups of immigrants from both Europe and Asia, and she details how they contribute to Canada as a whole. She concludes her book with a discussion of the Canadian mosaic as a “true painting for eternity,” composed of a human pattern cemented together by “good will and friendliness born of mutual respect and confidence between all peoples within our borders.” While this may seem close to our contemporary definition of the mosaic, she also emphasized the importance of conformity and repetition because “a principle of order must prevail in every ornamental composition – otherwise the pattern is spoiled and there will be disturbing patches.” Her focus on structure suggests a desire for one group–Canadians of British heritage–to structure and mould the overall mosaic. In order to create this ideal Canadian, Gibbon praised only very specific ethnic traits and traditions, ones that he believed would fit into his definition of Canadian national identity. This can be seen most clearly not in what he included in Canadian Mosaic, but rather what he did not. He discussed a large number of “racial groups”, but every single one hailed from Europe. Asian immigrants, Aboriginal peoples, and people of African descent were completely absent from Gibbon’s definition of belonging in the northern nation. John Murray Gibbon, Canadian Mosaic (1938). Gibbon also believed that Canada should ultimately become British. In fact, the first thing he did when describing any ethnic group was to link them to Britain, whether it be the similar traits in the case of Scandinavians or historical ties in the case of Czechoslovakians. It was these specific traits and historical links that he sought to use as materials for the mosaic, while either replacing unwanted characteristics with Canadian values or leaving them in the Old World by discouraging the entrance of certain groups. He viewed “the Canadian race of the future” as being “made up of over thirty European racial groups,” which would apparently continue the development of the Anglo-Saxon race, which itself was a “product of the commingling of perhaps a half dozen primitive stocks.” If Gibbon’s mosaic was a piece of art that illustrated the Canadian nation, then the frame which surrounded it was British. And if he praised diversity, he also did so in distinctly 1930s ways that emphasized the biological traits of European ethnic groups, and that looked to eugenic thoughts about selecting what groups should be incorporated into the national body. When analyzed alongside the common contemporary perception of the mosaic as something synonymous with progressive multiculturalism, Gibbon’s model seems to lack several important elements of diversity. Twenty-first century conceptions of the mosaic have clearly evolved since Gibbon’s 1938 book, just as his theories were different than Hayward’s and Foster’s. Yet the definition of the mosaic has always revolved around how Canadians regard difference, with Hayward viewing it as exotic, Foster as a way to build a stronger nation, and Gibbon as something to change and fuse into the Anglo-Saxon race. Evolving visions of the mosaic reflect how Canadians have understood immigration, belonging, and more recently multiculturalism. While some scholars, such as John Porter in his 1965 The Vertical Mosaic, have critically analyzed the mosaic, there continues to be a lack of discussion about how contemporary Canadians understand and engage with this powerful image of a society. The term is often batted around in the media and at citizenship ceremonies as an unquestionable marker of Canadian values. In the context of public debates about refugees, temporary workers, multiculturalism, and reasonable accommodation, Canadians would perhaps like to know where the term mosaic came from, and to reflect on its value as a positive metaphor about pluralism and citizenship. Bryce, Benjamin. “The Mosaic vs. the Melting Pot? A Roundtable and Podcast.” Active History. 23 Nov 2012. Foster, Kate. A. Our Canadian Mosaic. Toronto: The Dominion Council, 1926. Gibbon, John Murray. 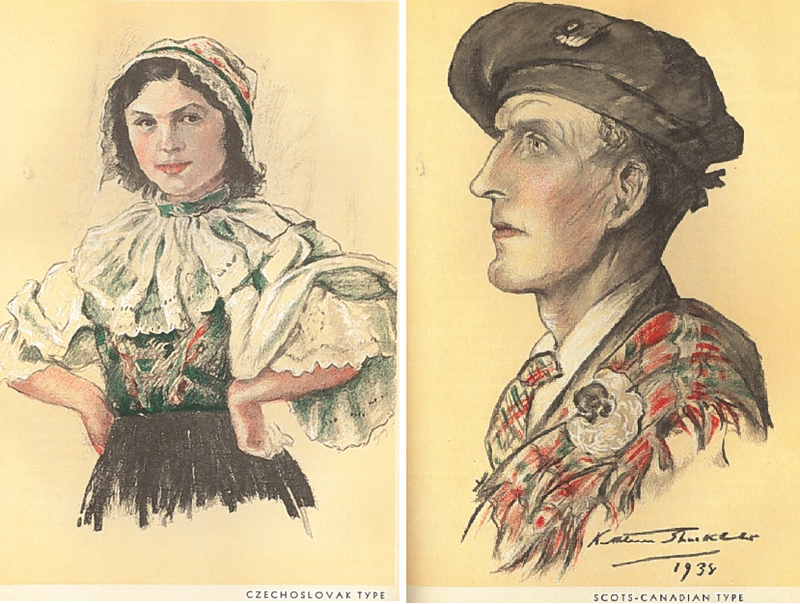 Canadian Mosaic: The Making of a Northern Nation. Toronto: McClelland & Stewart Limited, 1938. Hayward, Victoria. Romantic Canada. Toronto: MacMillan, 1922. Porter, John. The Vertical Mosaic: An Analysis of Social Class and Power in Canada. Toronto: University of Toronto Press, 1965. Confronting Canadian Migration History by Ryan McKenney and Benjamin Bryce is licensed under a Creative Commons Attribution-ShareAlike 4.0 International License, except where otherwise noted.